Happy Tuesday, crafty friends! Let me just say - the past few weeks have been a whirlwind! With back to back trade shows, one of them being in Germany, and just so much to do...it has been crazy around here! Thank you for your patience as its been quiet on my blog - some things just have to give a little when life is so busy! I had a wonderful time at both trade shows, and I will do a recap post for you at a later date - maybe over the weekend. 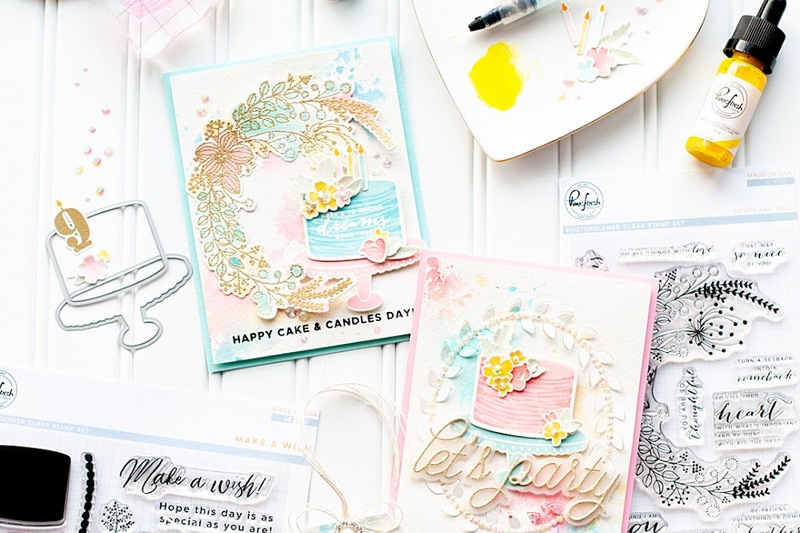 But today I am excited to be part of the MFT & Friends post for their February 2019 release! Before I get to my card, I wanted to share some really great deals that MFT offers when you shop with them! They offer free U.S. shipping on all orders $50+. 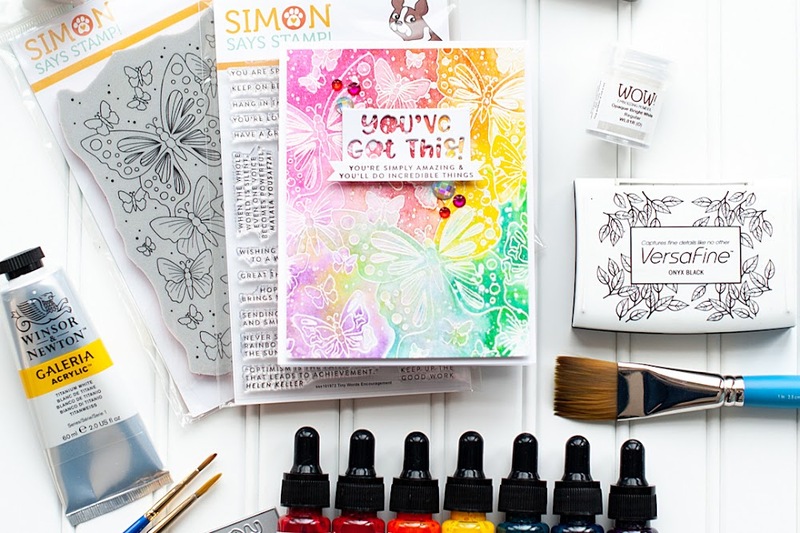 They also offer a free die with $60+ order, which I have used on my card today! It is that beautiful Birthday Wishes word die - isn't it gorgeous?! And if you needed another reason to shop MFT, their Shop to Save discounts start at 10% for each order over $100 and go up, up, up to a savings of 25% on orders over $750! Birthday Bear & Friends is being featured in our February donation campaign — 10% of all retail sales of the Birthday Bear & Friends stamp set and Die-namics through the end of February will be donated to the St. Jude Children’s Research Hospital. For every $25 raised, MFT will donate a No More Chemo party to St. Jude. I will be using this special stamp set in the VERY near future! I love what it stands for, and what MFT is doing with it. Please consider purchasing this stamp set this month so that they can donate many No More Chemo parties to St. Jude. As a mom who had a baby in the hospital for a very long time...it is so hard. My story didn't end happily, but it really is so amazing when they do. Parties like this are a BLESSING. To start, I diecut the Birthday Cake die from 110 LB white cardstock. This die comes with two cake detail dies attached to it, so I snipped those off but kept the rest of the cake intact. this made it easier to diecut together, as I wanted colors to peek-a-boo from behind some of the layers. Next I adhered a block of jewels in a rainbow gradient behind the cake layers. I ended up pushing the purple layers out of sight, as I didn't love the transition as much. I traced the candle flames to a block of cardstock the same size, then placed either an orange or yellow jewel over top of each each traced flame. I adhered both white cardstock layers together with foam tape, then glued them to the front of a black A2 card base. 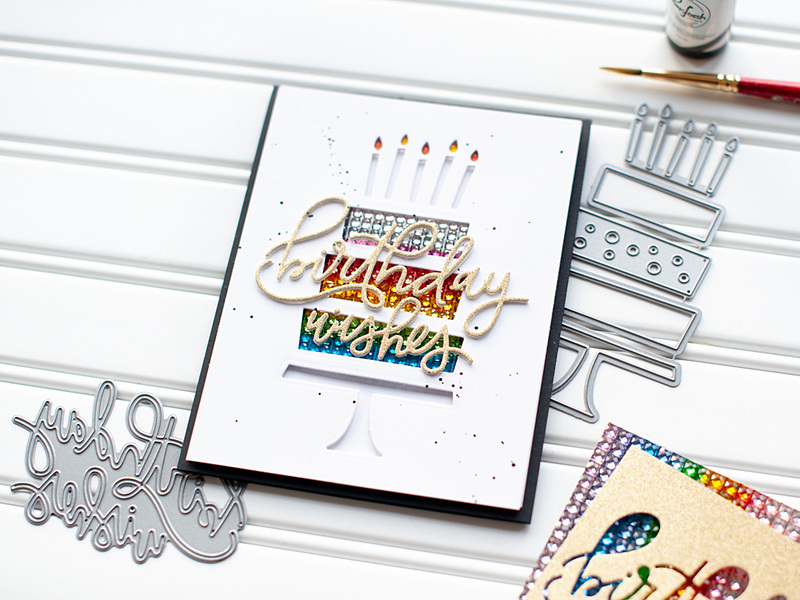 Next I diecut the Birthday Wishes word (this is the free die w/ $60) three times; once from gold glitter paper, and two times from 110 LB white cardstock. 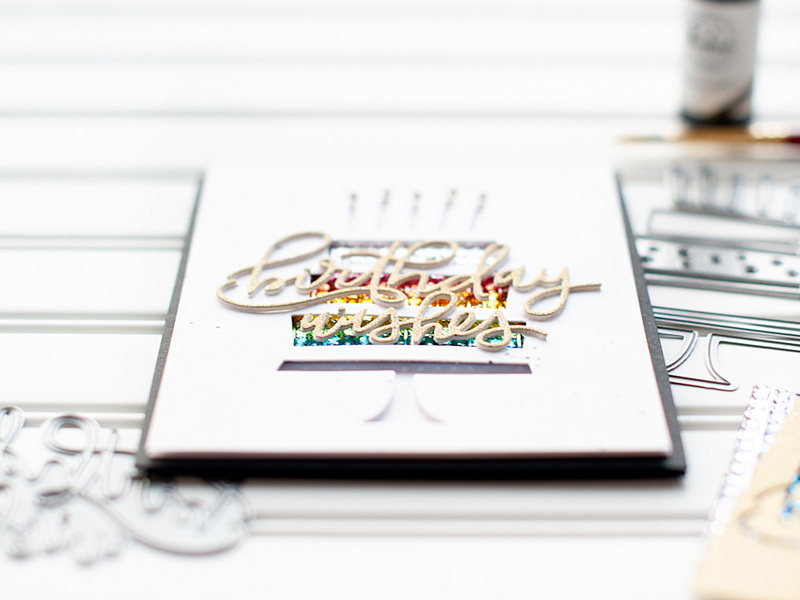 I layered them together with a Zig glue pen, then arranged them to the front of the card. Once they looked how I wanted, I adhered them down with mixed media adhesive. 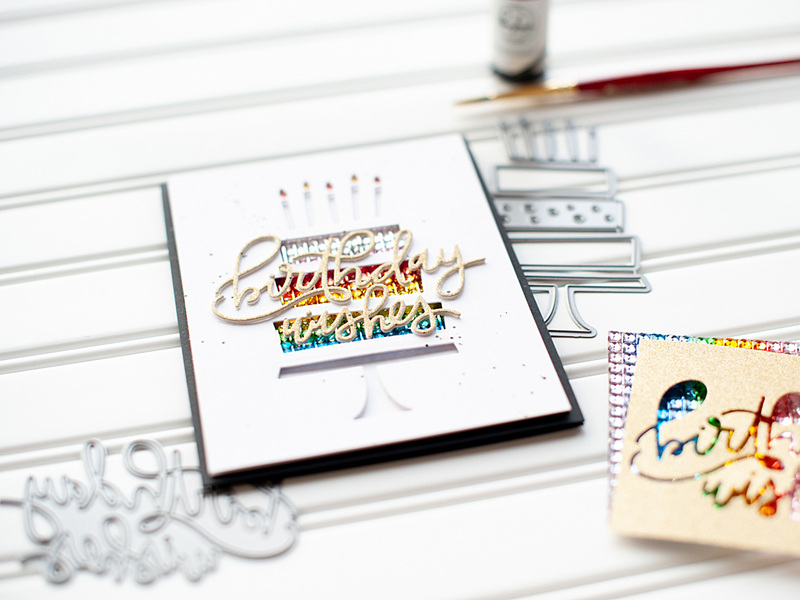 As I mentioned, I have two more guest posts with MFT Stamps this month - on the 14th and 21st. You will get to see more of this beautiful release in action, with more technique & color driven cards using some of the adorable critter sets released! That is all I have for you today! 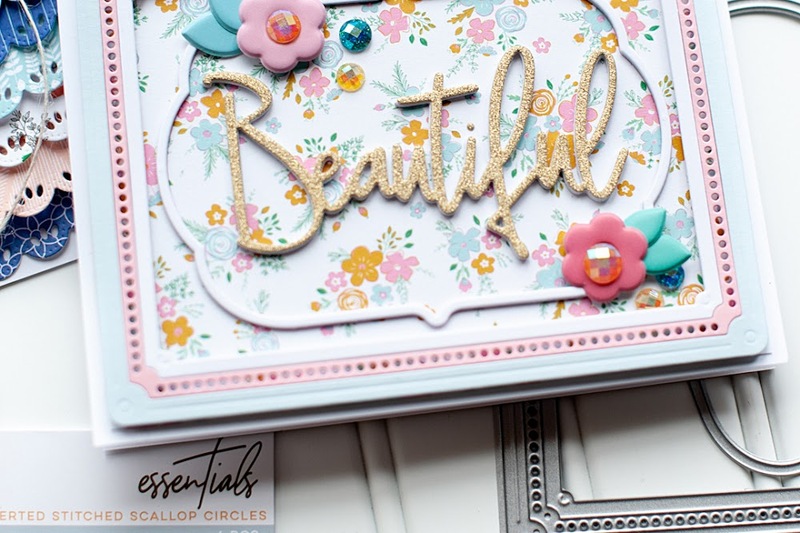 Be sure to see what all the other amazing designers have created with this new release on the MFT & Friends February post at the MFT Blog. And be sure to take advantage of all the shopping options I've mentioned above! Shop HERE for the new release! Before I close, I wanted to mention that there are two really great Pinkfresh Studio promos going on right now. They are updated on my CRAFTY SALES page, so head over there to check them out. I also wanted to invite you to follow me on social media. I would love to be crafty friends! Have a terrific rest of your Tuesday! I love your jeweled cake! Great design and so pretty! 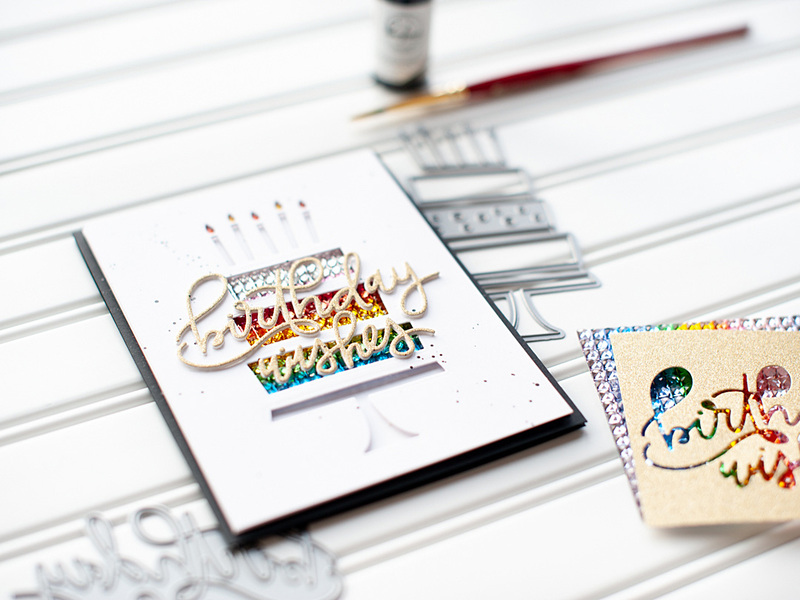 Such a creative and fabulous idea to use the jeweled background! It looks so neat and makes that cake really sparkle! Very pretty! What an elegant and beautiful card! What a simple yet attractive card! Your card is so elegant! Love your idea of jewelled cake! So creative! 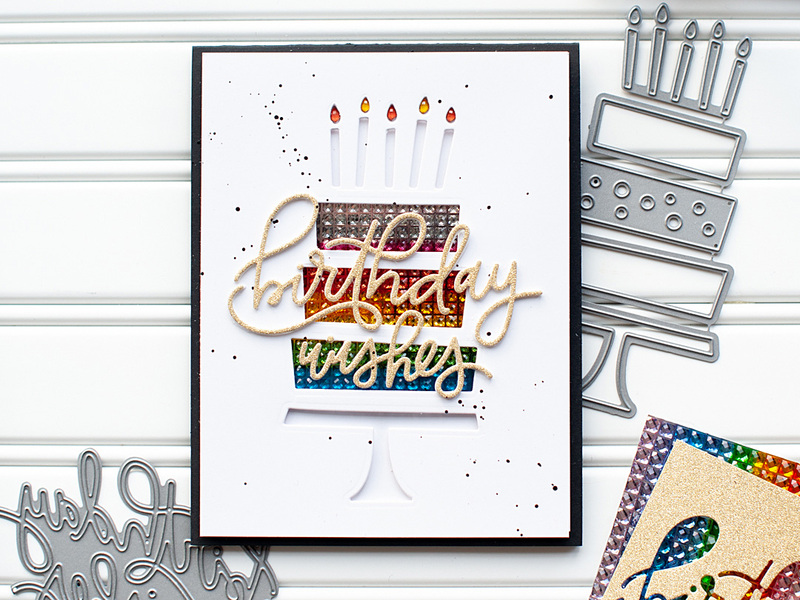 beautiful combination of the birthday cake and wishes dies. Fantastic cake and card. Love it. So lovely as always – your work rocks! Nicely done, great card design! I love what you did with this die set. It went from cute to beautiful with your use of jewels! 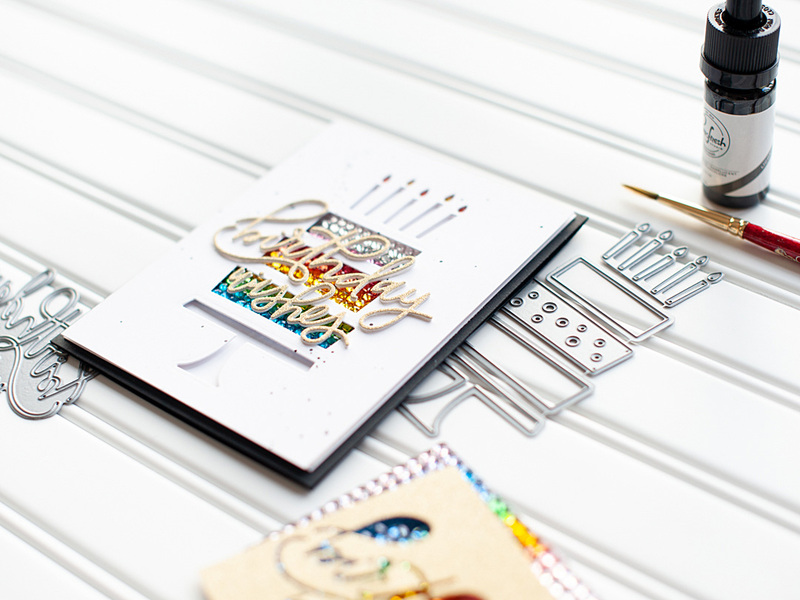 It may be simple, but this card is a stunner! I love the rainbow jewels behind the cake; it's so unexpected. Thanks for sharing this great idea with us! Love the color peaking through the cake. Loving this release! I love your card! 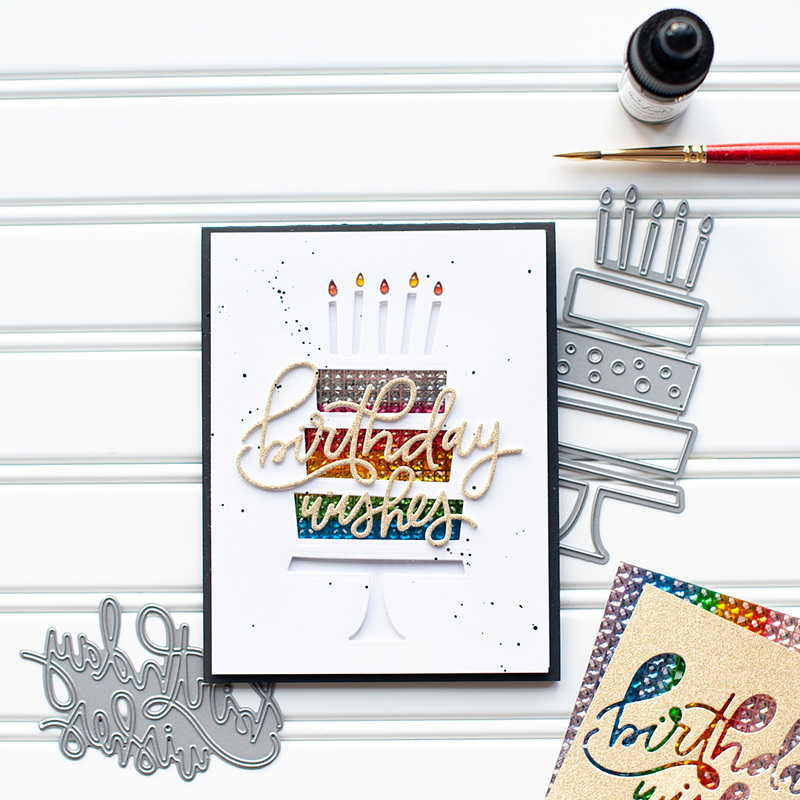 Both the birthday cake & birthday wishes sentiment dies are on my list so I need to place an order soon to get the sentiment die! A bejeweled birthday cake... and why not?!? It was fun reading about your process and I'm looking forward to your other MFT posts this month! STUNNING! I love the sparkly and splatter! Awesome card! Love the cake and sentiment! I love your card, and the way you use both dies is really dynamic! Love this CAS design Lea! The pop of color is perfect! Thanks for the inspiration! Wow! This is so cool!!! Love your creativity!!! Amazing card!!! Wow! You know how to make a fantastic, strikingly beautiful cake! Your jeweled cake layers are fabulous! Great idea to use the negative die-cut! this is a fantastic die set. 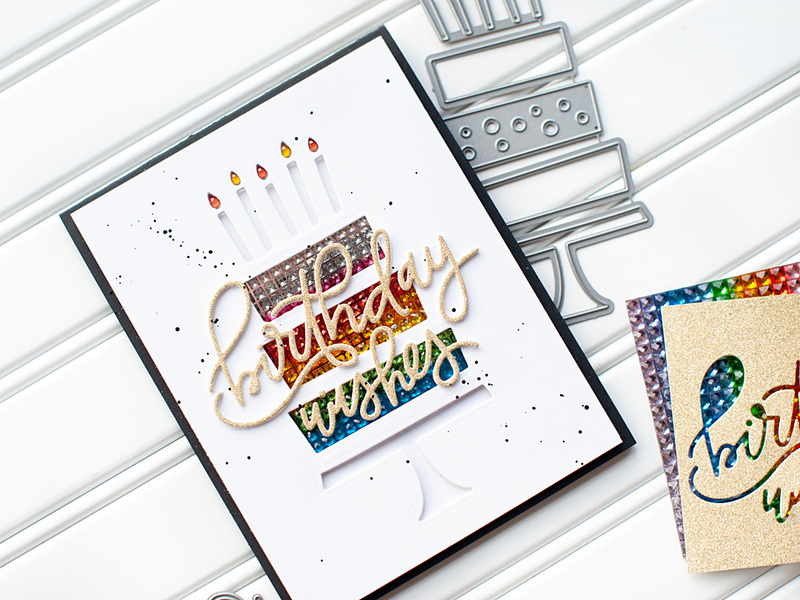 Love your card design, and that birthday wishes die is so fabulous - love the font of it! Beautiful card. Love the bling on it. What a fabulously design card! I love the dimension on sentiment. I'm sure it took a while to stack them but it's a great final result. Creativity at its best! I would never of thought of a bejeweled inside of a cake. WOW!!! I am in love with how you used the cake die. I love all the colorful rhinestones you used!! Eeee, love these cards and how they highlight the dies! The rainbow gradient of gems is fantastic! That's a really pretty way to use the cake die. The rainbow of gems gives so much sparkle, and I really like how you put them under the flames as well. Love the scripty sentiment! The jewels peeking through are stunning! Brilliant cards! LOVE the peek a boo effect! What at great card! I love the design and layers! Love the jeweled backdrop & the simplicity of this one. Your card design is perfect! Now I need that cake die for my collection! I might be a CAS card but the color inside the cake layers makes it pop. Such beautiful and elegant card! Thanks for the inspiration. Such cool cards! Love the jewels - wonderfully creative designs. Love how you used the new products. Thanks for sharing. How creative and lovely! I adore this card!! Super fun and awesome card!